Researcher Eric Nestler showed that when a rodent goes through 10 days of defeat stress (being defeated repeatedly by a larger animal), they begin to exhibit behaviors resembling those seen in depression. Social avoidance was the most robust change, and continued for the rest of the animal’s life. Animals did not have to be physically attacked by the bigger animal to show the depression-like effects of defeat stress. Just witnessing the repeated defeats of another rat was sufficient to produce the syndrome. 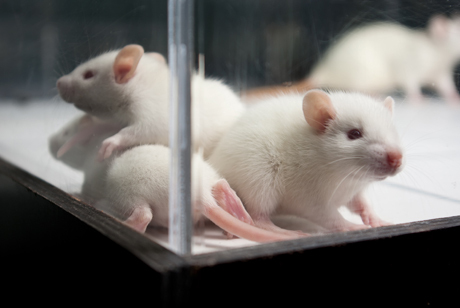 Again, father rats that experienced defeat stress or witnessed it passed this susceptibility to defeat stress on to their offspring (with whom they never had any contact), likely by epigenetic changes to sperm. Editor’s Note: People take genetic vulnerability seriously, and doctors counsel families with bipolar disorder to be on the lookout for symptoms and engage in preventive measures as necessary (just as a family with a history of heart disease or breast cancer might increase vigilance and preventative measures). The risks of psychiatric illness through epigenetic mechanisms should be taken equally seriously, and families should consider preventive interventions as needed. The evidence for epigenetic inheritance has profound clinical implications, if it is found that similar epigenetic mechanisms occur in humans. Earlier research indicates that maternal behavior can bring about long-term changes in offspring behavior and biology. Anxiety and stressors in a mother can bring about epigenetic changes to eggs, and can also affect a fetus in utero. Now it appears that a father’s sperm can also convey information about the fathers’ drug use or experience of stress to subsequent generations. Now we know that life experiences of parents can also affect their offspring through epigenetic changes to genetic material. In the US, the parents and grandparents of patients with bipolar disorder are more ill than the parents and grandparents of patients with bipolar disorder from the Netherlands and Germany. Family histories in the US include more unipolar depression, bipolar disorder, alcohol and substance abuse, suicide attempts, and other psychiatric illnesses, and a family history that includes these illnesses is associated with an earlier age of onset of bipolar disorder and a more difficult course of illness. Patients with bipolar illness in the US also reported more of these difficulties (excepting suicide attempts) in their children than patients with bipolar disorder in the Netherlands and Germany reported about their children. Thus, we have seen four generations (patients plus their grandparents, parents, and children) with more cases of bipolar illness and more severe illness in those from the US compared to the Netherlands and Germany. It is likely that that this illness burden is conveyed through both genetic and epigenetic mechanisms. These data also suggest that future generations in the US are at increased risk for illness complexity, and that we should take these clinical findings seriously and try to head off the early development of bipolar disorder with new approaches to treatment and prevention. This is a clinical and public health necessity, and one with a sense of immediacy. On a more speculative and preliminary note, the conveyance of information transgenerationally via epigenetic marks in sperm raises a potential ameliorative approach for consideration. Should people consider harvesting and freezing their sperm when they are young adults? The offspring of older fathers are at greater risk for some illnesses such as autism and bipolar disorder. It has long been though that mutations in sperm increase as a result of the aging process, but the current data raise the possibility that an accumulation of environmental factors (such as stressors) causing epigenetic alterations could also play a role. Women who want to delay childbearing sometimes freeze their eggs when they are young (and eggs are more plentiful and likely to be viable). Perhaps younger men should also consider storage of their sperm for later use. In this way, the number of mutations from aging would be reduced, but so might the influence of epigenetic alterations. This might also be particularly appropriate for consideration in men who will undergo the pernicious effects of chemotherapy for cancer or even in those who will be deployed to high risk war zones where they could be exposed to traumatic experiences resulting in PTSD (which also conveys an increased risk for alcohol and substance abuse). Preserving sperm for later use might help prevent not only mutations that occur with aging, but also adverse epigenetic marks that could accumulate over time.